Nowadays New Years Resolutions are very commonplace in society. Personally speaking, I find this landmark to be nothing more than an excuse so some people can quit smoking or loose weight. However, there was one man in particular who didn't want to do anything so pedestrian. Oh no! He used this date as a reason to become a famous serial killer. Here, check out this one hour documentary made in 2012 to see who it is that I'm referring to. In this episode of 'Born to Kill?' Christopher Slade chronicles the not so gay life and times of homosexual serial killer, Colin Ireland. Now Christopher's oration is aided by a number of video-clips, stock photography, and one on one interview's with people familiar with his crimes. For example there's Detectives: Martin Finnegan, Albert Patrick, and Terry Webster; Journalists: Brandon Malinsky and Colin Richardson; Criminologists: David Wilson, Helen Morrison, and Louis Schlesinger; plus his second wife, Janet Young, and two of his friends, Richard Higgs and Colin Brown. What now follows is a basic break down of how his program plays out. Who is Colin Ireland? Colin was born on the 16th of March, 1954, in Dartford, Kent. His Farther left his young Mother not so long thereafter, leading them both to move from pillar to post, just so that they could make ends meet. What were his crimes? 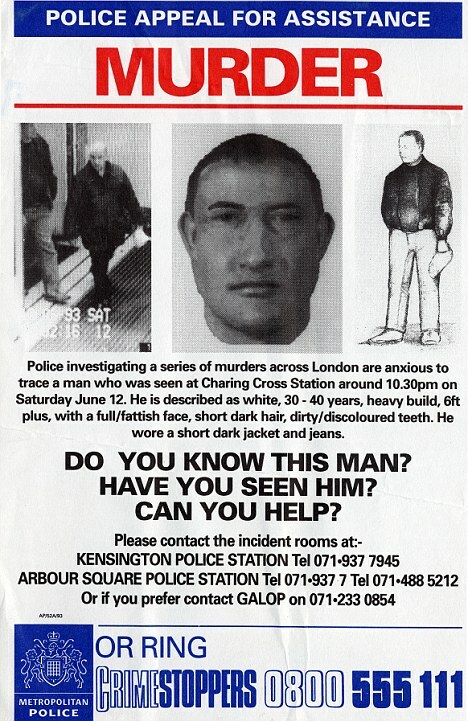 In 1993 he killed five gay men in and around London, England, just so he could become a famous serial killer -- this was his baroque New Years resolution. Was Colin gay then? Well, according to Colin, no. He chose to kill gay men because he said they were an easy target for him. Moreover, to substantiate his own heterosexuality, he was married twice. First to a disabled lady who he cheated on. And secondly to a barmaid he duped. Peter Walker -- a 45 years old choreographer from Battersea (killed Monday 8th March, 1993). Christopher Dunn -- a 37 year old librarian from Wealdstone (killed Thursday 20th May, 1993). Perry Bradley III -- a 35 year old businessman from Kensington (killed Friday 4th June, 1993). Andrew Collier -- as 33 year old housing warden from Dalston (killed Monday 7th June, 1993). Emanuel Spiteri -- a 41 year old chef from Hither Green (killed Saturday 12th June, 1993). What was Colin's Modus Operandi? (1) All of his victims were homosexuals that frequented a gay pub in Clapham called 'The Coleherne'. (2) He lured them back to their home with a promise of a sexual encounter. (3) He'd rob his victims before killing them. (4) He would dispose of any incriminating evidence by throwing these items out of a moving train back home, to Southend. (5) He'd taunt the authorities about his crimes afterwards. (6) Toys were placed by the side of their dead bodies if any were at hand. How was he caught? The police arrested Colin for the death of Emanuel when they identified him to be the last person to see him alive. Afterwards, they also managed to connect him to the other murders as well. Colin Ireland died on the 21st of February, 2012, of natural causes, whilst serving a life sentence at Wakefield Prison. Sometime in 1993 I was suddenly woken up in the early hours of the morning by a very loud noise coming from two streets along. 'F*cking hell!' I thought to myself. "What's that all about?" I continued. Only to then fall asleep and wake up the following day, and discover that my mate's neighbour's house was burnt down that night. Or 'Emanuel Spiteri's house' to be more precise. OK, to be perfectly honest with you, I did not know Emanuel all that well. He was my mates neighbour. And somebody I'd say 'Hi' to whenever I went visiting. Nonetheless, I was still a bit upset to hear that he snuffed it in that fire, and was even more alarmed to find out why. Though, why is this 'why', huh? What in hell prompted a nutter like Colin Ireland to kill a man just because of his sexual proclivity? Granted, this episode of 'Born to Kill' does tell us 'the why' in not so simple terms. 'Colin was a 'hard luck Hendry' who wanted to make a name for himself, by killing off gay men because of something that might have happened to him during his childhood'. However, I have another take on this theory. A more filmic take. Now the movie I am referring to is the Martin Scorsese classic, 'Taxi Driver'. Conceptually, this flick is about a contradictory man who does his best to get nowhere in his life. For example: He'd keep fit whilst eating junk-food. He'd abase his own relationships by exhibiting baroque behaviour. And he'd attempt to save the life of a young prostitute by killing off her pimps. Etcetera. Etcetera. Etcetera. Do you see where I am coming from this? Colin Ireland is the type of person who is so messed up in his head, that he thinks that he is doing good by actually doing bad. Mixed messages you see. Not enough clarity of thought to look into his own soul, and try to figure out why he hates gay men so much. Well, have you ever wondered why you might hate a certain portion of society? Is it genetic? Something to do with your upbringing? A past encounter perhaps? Or something else entirely? That was Colin's problem. He could not see that the only thing which was eating him inside was the fact that he hated who he was on the outside. So he hated others. Anyway, 'Born To Kill? The Gay Slayer' puts it in a much better way than I have. More straight forward. Less filmic. And all in all a great show that has made me think once more (click here to see what I mean).